Part 1: What is 'the Cloud'? 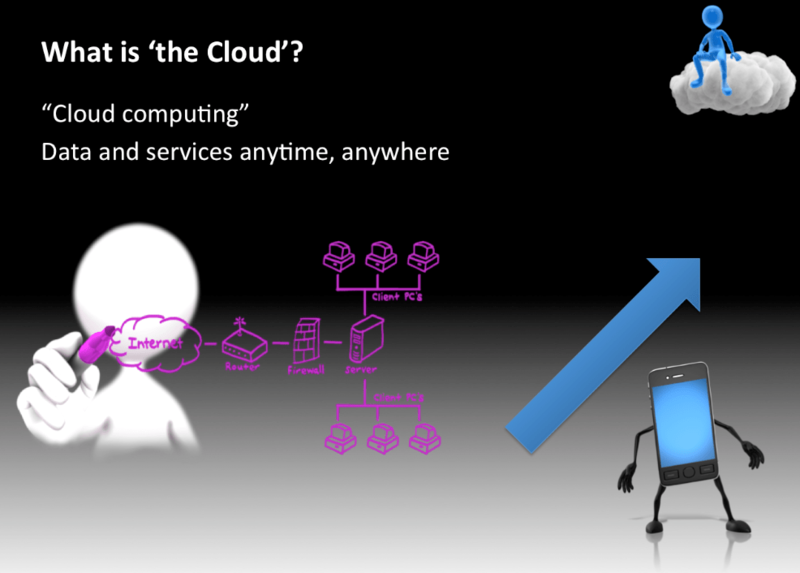 In the last few years, we have seen the emergence of 'The Cloud', which is a short form of the term 'Cloud Computing'. Cloud computing it not new: it has existed since the beginning of interconnected computers (the 1960s). However, the evolution of the Internet to provide Cloud-based computing services to the general public is a relatively new phenomenon. In early days, when you drew network diagrams, the interconnections were drawn as lines. As the computer networks became larger and more complex, the interconnection started to be drawn as a cloud (see the example). You could then concentrate your network diagram on the parts of the network that you controlled, managed, or cared about. Your network had to connect to 'the Cloud' but you didn't need to worry about drawing it out. Today, the term 'the Cloud' refers to the ability of running services over the Internet, rather than running the services on your local computer. For example, Google Docs allows you to access a Word Processor using any web browser on any computer that is connected to the Internet. That is, Google Docs is a cloud-based word processing application. One of the main benefits to Cloud Computing for the general public is the ability to access your data and services anytime and from any Internet connected device (almost – there are some limitations based upon the capabilities of the device). The growth in deployments of mobile devices has helped to fuel the need for Cloud Computing services. The relationship between oppression and empowerment?